“The educational foundations of our society are presently being eroded by a rising tide of mediocrity that threatens our very future as a Nation and a people.” These words from A Nation at Risk constituted the first shot in a war that has been raging since the seminal study on the U.S. educational system was published in 1983. A Nation at Risk found that 23 million American adults were functionally illiterate, that the average achievement for high school students on standardized tests was lower than it had been before the launch of Sputnik in 1957, and that only one-fifth of the country’s 17-year-old students had the ability to write a persuasive essay. Alarmed, schools and elected officials set about fixing the system, and in doing so developed a practical obsession with standardized testing, leading teachers to abandon creative programs to support and engage students along the way. Decisions about learning have moved further and further from the classroom over the years. Today, the loudest voices in the debate about how to improve education don’t belong to the stakeholders with the most to lose or gain, but rather to politicians, unions, and even religious groups. With practically every new president comes a new commission to tackle the system’s shortcomings. (This trend predates A Nation at Risk: We saw No Child Left Behind in 2006, the Task Force on Education in 1960, the Committee on Education Beyond the High School in 1956, and The Truman Report in 1947.) And yet little headway has been made here in Los Angeles and across the country. When writer Ed Leibowitz profiled former LAUSD superintendent John Deasy for Los Angeles magazine in 2012, only 62 percent of our district’s students were considered likely to graduate and close to 30 percent showed up for class without command of the English language. The 2014 National Assessment of Educational Progress, which grades how American students performed in three subjects last year, found 18 percent of students were proficient in U.S. history, 27 percent were proficient in geography, and 23 percent were proficient in civics. There were no significant improvements to proficiencies across the board since the last NAEP study was released in 2010. I believe there’s a solution: It’s called backpack funding, and it limits decision-making power to the individuals involved—students, parents, and educators. It also gives parents a way to reward classroom innovators by enabling those parents to remove their children, and thus their children’s funding, from schools that don’t perform. Some limitations would be necessary to protect underserved students from losing resources that could become too expensive for a shrinking school, of course. Instituting single zip code-based enrollment, for example, would protect entire neighborhoods from suffering as a result of lost funds. You may remember Mitt Romney once proposed using $25 billion in federal money to allow students to attend any school they choose—public, charter, online, or private—an idea, he said, that would introduce marketplace dynamics into education to drive academic gains. That’s the thinking at play here. A bill seeking to change the way schools are funded was recently introduced in Colorado. It does not fully embrace a backpack funding model, but it does take a step in that direction. The new legislation will send any funds set aside for students determined to be “at risk” or “English language learners” directly to the schools to be spent flexibly. I know the idea of backpack funding—and the engaging educational programming it could inspire—works because I saw a version of it in action with my son Eli. One day during his second year at Beverly Hills High School, Eli sat my wife and me down to explain that he wanted to sign up for FIRST Robotics, an engineering program created by Segway inventor Dean Kamen to develop talent in high schoolers. Kamen calls FIRST Robotics the “Olympics for Geeks.” We were surprised. Eli was already busy with track, honors classes, and a part-time job. To participate in FIRST Robotics, which is sponsored by many Fortune 100 companies, Eli and a team would need to commit about 40 hours per week to designing and building a robot from supplied parts under strict limitations on expenditures and outside help. Teams could accept help from “mentor companies,” but the students would need to recruit them and raise funds for the team to travel to the program’s competitions themselves. In its first year, Eli’s team had to raise more than $50,000, largely for travel expenses to regional competitions. They recruited Walt Disney Imagineering and Moog as mentors. It was amazing to see the dedication Eli and the other students put in to make the project a reality. 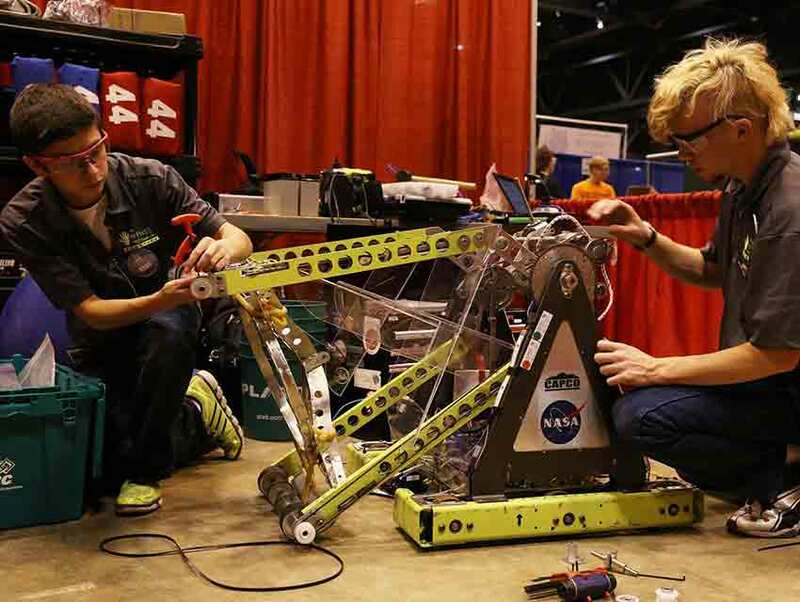 In their second year of competing, Eli’s team qualified for the FIRST Robotics finals, which was held in the Georgia Dome in Atlanta. I chaperoned the trip. Google cofounder Larry Page, who was a young tech entrepreneur at the time, flew out for the day to speak to the participants. He sat among them in jeans and a T-shirt, fitting in as if he were still a student. He told them something I will never forget: that they were about to enter a world shaped by engineers, not tangible products. He stressed that they would be engineers of ideas and software and that their work would involve collaboration with people from many countries. I could see his point. There was nothing more important to these kids than working together, even when they were on different teams. They were inspired and almost religious about it. The experience was education at its best, and it was profound. As a result of FIRST Robotics, engineering became a career option for many of the young students who participated in the program—including some from families without the resources mine has. In a 2011 article about FIRST Robotics for Popular Science, Rebecca Boyle wrote about a young participant named Alejandra Castro, a high school sophomore who “lives in one of the poorest parts of California and whose parents work in service-sector jobs.” Because of FIRST, Castro dreams of becoming an aeronautical engineer and working for NASA. The competition’s impact has extended into the education system. Kamen has convinced 30 percent of the high schools in Michigan to add FIRST Robotics to their curriculum and encouraged students at other schools to write their state representatives to lobby for it, too. Getting robotics added at my son’s L.A. school, however, became a battle. The school’s administrators were against it. They felt it was a club, not a class, and teachers didn’t care to supervise it, even though hundreds of students wanted to join. But students and their families eventually forced the district to create a course, and FIRST Robotics at Eli’s school has become one of the greatest programs of its kind in the country. He feels incredibly proud about his role in this. Why? Because students created the program and are largely responsible for running it. They have help from a parent, but the program’s success is not dependent upon parental involvement. Rather, it is supported extensively by mentors recruited by FIRST. Seeing how FIRST Robotics engaged my son and other children confirmed my critical view: Students should be treated as clients to be served by the school system and not the other way around. Backpack funding does that. Backpack funding isn’t a panacea for everything that doesn’t work well within the current structure of the school system, and I don’t suggest that making such a drastic change to such a big and complicated system would be easy. After all, it would cause the death of public education as we know it. But it would give way to a rebirth, too. Backpack funding would motivate and allow educators to prioritize engaging individual students. Is there a downside to the competition that would ensue to attract students? Underserved students could benefit from a system that makes possible the creation and funding of programs that tailor to their school’s needs. For all students, my bet is that you would see an explosion of programs like FIRST Robotics. I don’t think Larry Page would consider this a bad idea. Bill Chait is the managing partner of Sprout LA, a restaurant collaboration with chefs including Ori Menashe and Genevieve Gergis (Bestia), Walter Manzke and Margarita Manzke (Petty Cash and Republique), Rory Herrmann and Tim Hollingworth (Barrel and Ashes), Neal Fraser and managing partner Amy Knoll (Redbird), and Jason Neroni (Catch and Release). He is currently working on the new Otium Restaurant with chef Tim Hollingsworth and their partner, Eli Broad, which will be adjacent to the new Broad Contemporary Art museum on Grand Avenue as well as the iconic Rose Cafe in Venice with Jason Neroni.